Now will Microsoft release free iOS and Android Office apps? If you've ever cast a wanting eye at Google's Quickoffice app but never fancied shelling out for it, today's your lucky day. The internet giant used a company blog post to declare that the app, which lets you edit and convert Microsoft Office documents directly from a smartphone or tablet, is now available for the grand sum of nothing. Google bought Quickoffice in June last year in a bid to take on Microsoft Office by letting people edit popular file types on the move. It was previously free for subscribers to its Google Apps service, which starts at £33 per user per year, but now anybody with an iOS or Android device can download it from the App Store or Play Store respectively. Google is seemingly in good spirits, as it's also decided to throw in an extra 10GB of Google Drive storage that lasts two years to those that download and sign into the app before September 26. In addition to editing them, Quickoffice also lets you convert Microsoft Office documents to Google's own formats to make them compatible with Google Docs, Sheets, and Slides. Moreover, they can be saved to its Google Drive cloud storage service, meaning that extra 10GB will come in handy. You'll need to sign in with your Google Account once the app is downloaded to edit Office documents or spreadsheets on the move. Google says that the now free app has been bolstered with new features including the ability to create .ZIP folders and view charts in Excel and PowerPoint files. Making the app free should help deter the legions of Android users (the platform's had more than one billion activations) from switching to Microsoft's Windows Phone 8 platform, which comes with a built-in editor for editing Office documents alongside free SkyDrive cloud storage. Microsoft has released iOS and Android versions of Office, but you'll need an Office 365 subscription to use them, and free versions don't appear to be on the cards. 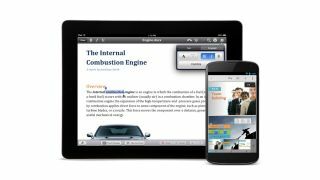 Apple recently stepped up its efforts in the mobile document editing war by making its iWork suite free on all 'new' iOS devices.